Fighting For Compensation After A Wrongful Conviction And 38 Years In Prison Fred Clay, whose conviction was overturned, could be paid up to a million dollars from Massachusetts. But state law makes it difficult to collect. At age 17, Fred Clay was sentenced to life in prison without parole. 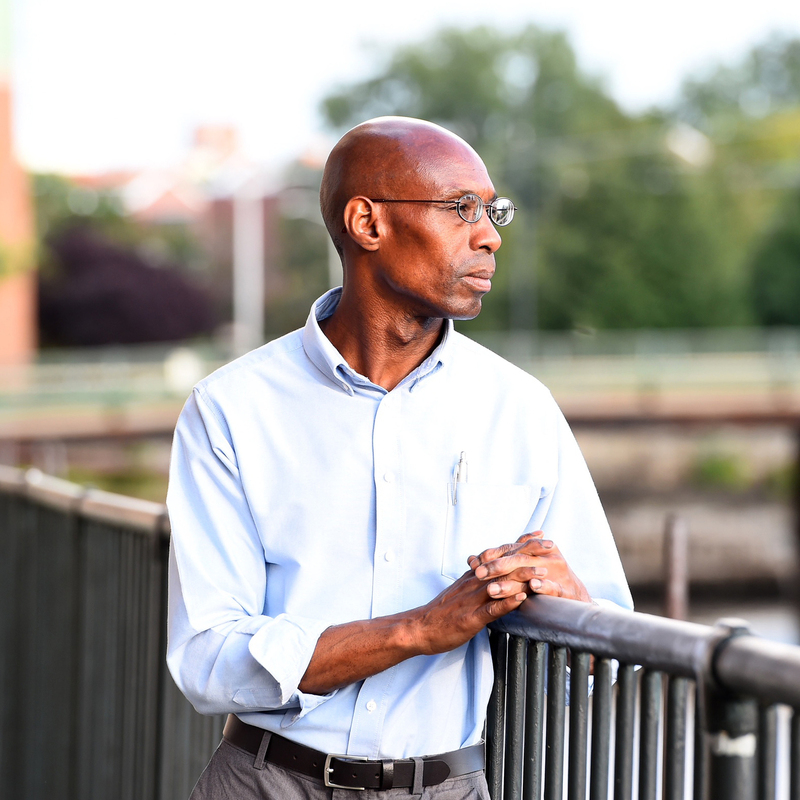 Thirty-eight years later, his conviction was thrown out, and now he's trying to rebuild his life, and working to get compensation from the state of Massachusetts. The testimony of that witness helped send Fred Clay to prison where he stayed for almost 38 years. Then his case caught the attention of lawyers working on innocence projects, aimed at exonerating the wrongly convicted. It took Clay's lawyers almost six years to convince the state that his murder conviction was deeply flawed and unjust — partly because of the now-debunked use of hypnosis. How people maintain their sanity dealing with all this craziness I have to deal with, it's not easy. Just over a year ago, that murder conviction was thrown out by a superior court judge in Boston and Clay was released. He could qualify for up to $1 million in compensation from Massachusetts for being wrongly convicted. But so far, he hasn't seen a dime. "How people maintain their sanity dealing with all this craziness I have to deal with, it's not easy," Clay said. "I just feel sad about a lot of things I've missed out on." To win compensation in Massachusetts, people like Clay have to sue the state and prove they're actually innocent, not just released on a technicality. As Clay and his supporters have learned, that process can be lengthy and frustrating. Three months out of prison Fred Clay was still jobless, surviving on food stamps and some of the money raised by his supporters. Filling out job applications meant accounting for the 38-year gap in his employment history. And while Clay's conviction was overturned by a judge, an employer checking for a criminal background would still see his arrest for murder. You'd expect someone wrongfully locked up for almost four decades to be very bitter. While Clay is angry, he is mostly grieving. Clay never learned to drive, he never got married, and until recently, he never learned to become self-sufficient. If he receives the million dollar payment — Massachusetts caps such awards — it would amount to $26,000 for each year he was locked up. "Thirty-eight years out of my life — that's not going to make up for that. It's small kind, small money," he said. "They made me pay for someone else's mistakes all these years. So why can't they just admit to their mistake and just not fight it? Okay, you deserve something. So here we go." If Clay were on parole, he'd be entitled to reentry services, like a social worker and help with finding housing and jobs. But so far, Clay hasn't gotten any of this support from the state. Massachusetts' top attorney admits that the process to win compensation in the state has set a very high bar, and one that possibly should be lowered. 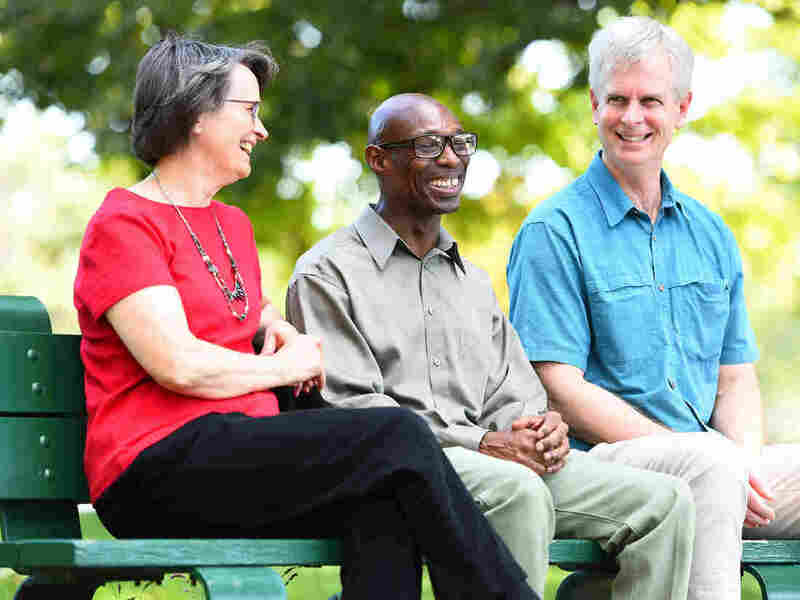 While in prison serving a life sentence which was later overturned, Fred Clay was introduced to Jacki (left) and Doran (right) Dibble. Over the next 17 years, the Dibbles and their children visited Clay every two or three months. "It would be really worthwhile to look at changing the law," said Massachusetts Attorney General Maura Healey. "If the state erroneously convicted you, right, and deprived you of liberty, you should be compensated for that. I would like to explore with the legislature if there could be a different process." Local Innocence Projects are also pushing for change, and pointing to states like California that just passed a law to get quicker help for exonerated people. Less than half of the roughly 2,300 people who were wrongfully convicted in the U.S. got any compensation, according to a study from the National Registry of Exonerations. Some states don't have any laws to compensate innocent people they imprison. Still waiting for official help, Clay has relied on volunteers and friends for guidance. Doran and Jacki Dibble began visiting Clay in prison 18 years ago, even bringing along their children. They've supported him as he maneuvers through life on the outside. "Prison life was easier than this," said Jacki Dibble. "And we told him, you know, when you leave here, the real work begins. Freedom is good, but it comes at a price and it's a steep learning curve for him. It's like cramming 38 years of life experience into one." Clay says he just wants to focus on survival skills, learn to budget, get into a healthy relationship, and do something he would have done as a teenager if he hadn't been put behind bars — learn how to drive. "I'm just trying to live my life right now based on what I missed," he said. "It's been a big rush to do all kinds of stuff." He tries to avoid thinking about his compensation lawsuit — it only stirs up anger about the injustice he endured. Clay knows it could take many more months to find out if he'll get anything from the state. Meanwhile, Clay is learning the basic survival skills to keep a job and roof over his head. Fred Clay, wrongfully convicted and jailed for 38 years, meets with Kim Yeasir, head of the nonprofit Thrive Communities. 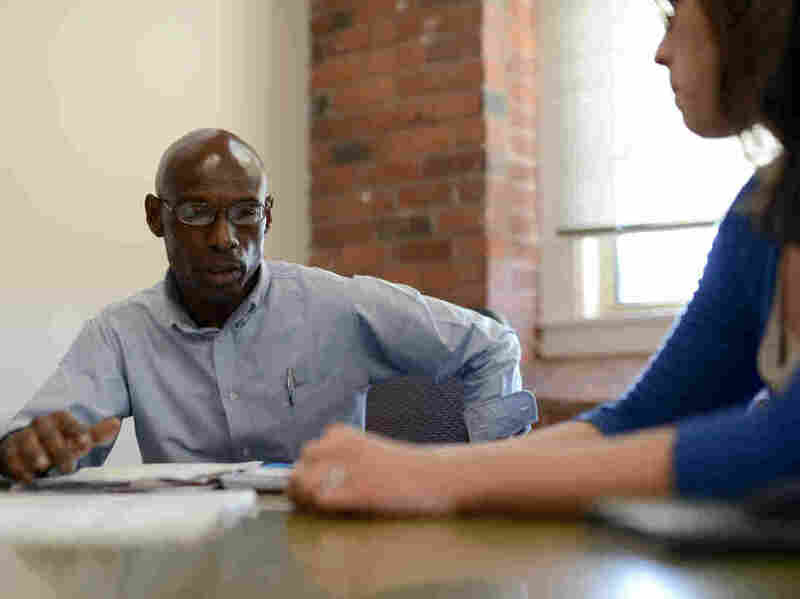 The organization, based in Lowell, Mass., mentors people coming out of prison. Early on a recent morning, he's up with the songbirds and dressed in his uniform — navy pants and a maroon shirt with his name stitched over the right pocket. The job he landed nine months ago is precision-grinding aviation parts. Starting pay was $12 an hour, and last month came his first raise to $14 an hour. He's grateful for the job. "They realized that I had a raw deal and they wanted to give me a break. They've been real nice," he said. "I like to work. I'm dependable and I just wanted to get a chance to prove that to people. And they gave me a chance to do that." As good as it feels to earn some money, Clay's paycheck is no match for rising rents in Lowell, an old factory city north of Boston. He's being priced out as sprawl reaches the city. His $650-a-month rent gets him a basement bedroom that reminds him of a prison cell. While he's frustrated with his current reality, Clay keeps trying to reclaim what was taken from him. At a job fair in Lowell — straight from work — Clay talked to every employer. It was a huge shift from a year ago; at that time he talked about being wary of meeting strangers. Clay says he's just being practical, hungry for the next leg up. "A closed mouth never gets fed so you gotta speak up," he said, breaking into laughter. It was the dinner hour when Fred Clay left the event with volunteers from a local nonprofit. As usual, he declined their offers for a ride home. He flung a blue fleece jacket over his shoulder and began to walk the mile and a half back to his bedroom in a basement. Along with waiting for his compensation lawsuit to play out, he's also in line for a housing subsidy. This piece comes to us from the New England Center for Investigative Reporting.